So easy to make and so fun to eat. 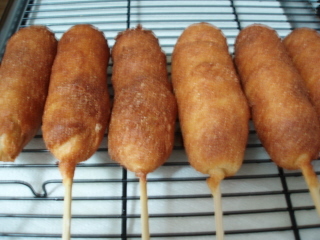 Mama's corndog recipe will take you back in time to when you were a kid at the county fair! You can even cut the hot dogs in half and make mini corn dogs! The cornstarch is key to keeping the batter from sliding off of the hot dog so don't skip that step! In a large bowl, stir together corn meal mix, flour and sugar. MIx together the egg and buttermilk. Add to the dry ingredients. Pour in the bacon drippings (you can use vegetable oil but the bacon dripping gives it a better flavor). Mix well. Allow to sit for 10 minutes. Pour the batter into a tall drinking glass. Pat the hot dogs dry with a paper towel. Put one stick into each corn dog. Roll in the corn starch and shake off the excess. Dip into the batter and twirl it around as you remove it from the glass. Immediately put it into the deep fryer and fry for just a minute turning to brown all sides. Be careful, if you leave it in the oil too long, they will become greasy.